Decades before the term street art was being uttered from ad executives' mouths, Blek Le Rat was bouncing about Paris throwing up political, thoughtful and humorous stencils... Banksy was quoted as saying, "Every time I think I've painted something slightly original, I find out that Blek Le Rat has done it as well. 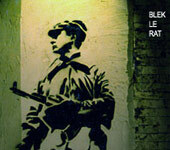 Only twenty years earlier..."
Where did the name Blek Le Rat come from? In the 1960s children used to read a lot of comic strips; I took on the name of Blek le Rat in reference to an Italian comic strip called Blek le Roc. I changed it into Rat, because I painted rats and the word "rat" is the anagram of the word "art" (something Banksy hadn't thought of!). How do you create your stencils? Are they xeroxed photo copies that you enlarge or do you draw them out yourself? Please explain. In the 1980s I drew all of my stencils, nowadays it depends on the stencil. Often I still draw the stencils because I am inspired by photographs that are not of a quality that lends itself to the stencil making process. I also use xeroxed copies on occasion, but not very often. I like the "handmade" aspect of the stencil, in both the preparation and the final image. Stenciling, though an antiquated medium, also has a very modern look and is ideal for street art, which is why so many street artists employ it. I also prefer black and white—I do not like colorful stencils much. Your forth coming book explains that it will feature half street art and half fine art. We're familiar with your stencil works. What kind of "fine art" do you do? Street art is ephemeral and it is very important to keep a memory of what has been done in the street. It is important to me that my fine art reflects the street or urban/public landscape in some way. I try to reproduce the ambience of the street where I often work at night when shades of black and white are dominant. 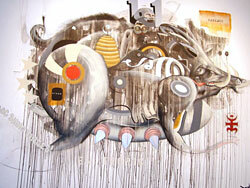 I use the same characters in the street as well as in the work I produce intended for the gallery. Are you producing much work on the streets in Paris these days? No. I don't work in the streets of Paris anymore because I know each and every inch of Paris. I love to work in places I don't know because these locations allow me to get in touch with a new atmosphere, new lights, and new people. If I continued to work in Paris I would have the instinct to do the same thing over and over again, without making any progress. To me, the most interesting aspect of street art is the constant opportunities to be surprised and/or amazed. I lose interest when something becomes routine. This legendary street artist who influenced artists like Banksy has a show opening at Subliminal Projects in LA April 5th. Our NYC correspondent, Manuel Bello interviews.